Everton manager Andy Spence is aiming for more this season and says he and his team haven’t put a limit on where the team can go over the course of the next 10 months. The Toffees finished ninth last season and Spence says he was “disappointed” with their finishing position and is looking to progress this season. “It’s a case of improving on what we did last year,” said Spence. “Lots of people told me we put in some good performances against the top teams, which I’d agree with, but we have to convert that into results and points on the board. Spence isn’t lying when he says his squad is young. Captain Danielle Turner is the joint oldest at just 26 and the left back believes the past 12 months have helped her become a better player since being handed the captaincy at the start of last season. “Last year was a major learning curve for me as captain,” she said. “I’ve learnt a lot in the last twelve months, trying to become a better leader and I’ve reflected on that in the offseason. I want to improve my leadership and hopefully that will have an effect on the pitch as well. Spence has added four players to this squad over the summer and lost players such as Jodie Brett and Courtney Sweetman-Kirk. 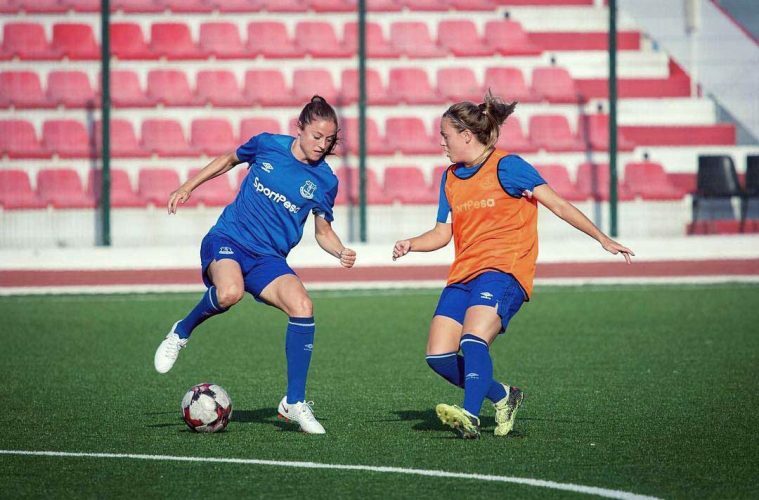 Dutch duo Inessa Kaagman and Dominique Bruinenberg have joined along with Abbey-Leigh Stringer and Hannah Cain, with Spence admitting the priority is to always be starting the season in a better position than the year before, something he believes Everton is doing. “There’s always a turnover of players, that’s the nature of the game and you’d like to come out in a stronger position, and I feel we’re in a really good place. Turner also believes all four new players have added something positive to the squad and the team went off to Gibraltar for a rare preseason trip abroad, something both feel was important. In terms of the new season, Spence is aware Everton will have to be at their most resilient with Birmingham City, Chelsea, and Manchester City as their first three games of the season, but admits he’s pleased his players aren’t setting their ambitions low for the season ahead. “We don’t want to put a limit on what we can do,” he said. “We’ve had a conversation about what our expectations are and it was refreshing to hear from all our players that we didn’t want to set a limit on that. We know we need to find a bit more consistency to our performances and delivering on that basis. In regards to the difficult start to the season, Spence is unmoved by the situation. There’s also been extra good news and bad news on and off the pitch for Spence over preseason. Assistant manager Martin Ho stepped away from his role to seek a new challenge but Spence has England Under-23 striker Claudia Walker back in his squad after a lengthy layoff due to injury. On Walker’s return, Spence added, “Claudia featured heavily at the start of last season and chipped in with goals and assists. I’ll throw the cliché out that it’s like a new signing having Claudia back. Spence also said there’s no “panic” about where Everton will play their home games this season and there will be an announcement to tie in with the start of the new season. There has though been one more change off the field with the boss now taking on a new Twitter account ahead of the new season, ditching his old handle for @AndySpenceEFC. “I’ve lost all my followers, though, so if you could give it a plug that would be great,” he laughed.